criminal offence | I'm skin deep. because I kiss the society's standards. After I filed the Magistrate’s Complaint at Crime Registry, Subordinate Court of Singapore, I was led to a little chamber to meet the judge. “You mean they’ve hit other customers, too?” I sought solace in community grievances. 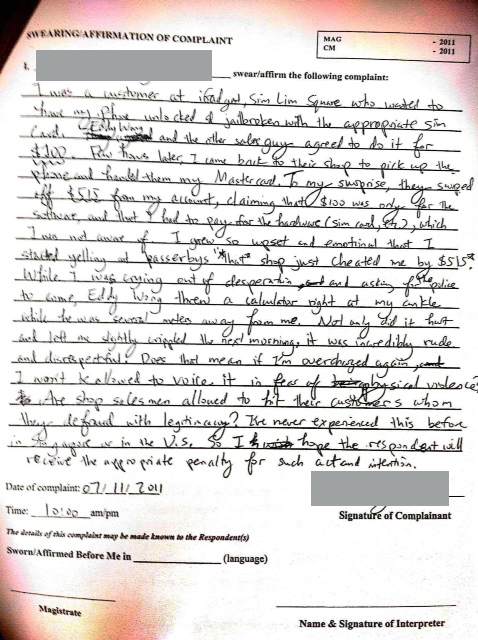 The reason he went on and on about the reputation of Sim Lim was that I didn’t really have any hope in my case – primarily due to not having a witness. Without a witness, I was only telling a story. The security camera, according to him, was a dummy camera that would erase all the record in 24-48 hours, and it wouldn’t capture very well. Even if it did capture the incident, the Sim Lim scum could defend himself by saying it was completely an accident that the calculator hit my ankle. Without a witness, it’d be a difficult to accuse the other party. “The security guard saw it. Should I ask the security guard to be my witness?” I asked. “The problem is that Singaporeans have not reached the stage where they’d go all the way to the court to help a stranger,” explained the judge. Oh I totally believed him in that. So, it is against the law to throw trash on the sidewalk and chew gums but legal to have citizens steal off of foreigners. How ironic is it that they know about the Sim Lim practice yet they don’t investigate? Instead of sending undercover cops, they simply close one eye and let it corrode? A friend suggested me to do investigative journalism and post it to Youtube – that would really embarrass Singapore.